The Export function allows converting Interactive Calendar database information into other formats and sharing this information with other programs. To use this function, choose the "File - Export" program's main menu item. Set the format you would like to convert the information to. Specify the file you want to export the information to. 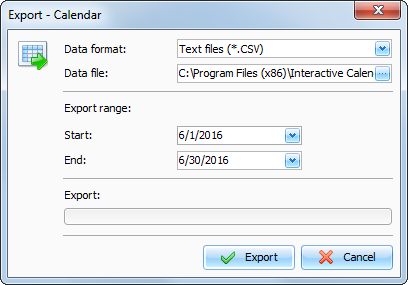 Select the Export Range dates (for CSV and XML format). You will see the Export progress indicator in the lower part of the dialog box. A notification message will appear when the export process is complete.